Are you looking to upgrade your current boiler? replace a broken or inefficient boiler or install a full new heating system? If the answer is yes then look no further. We can help do this for you. You won't believe how quick we can have a new boiler up and running for you at cheap prices and great warranties for peace of mind. Working in your home throughout the installations we will be respectful of your family and property. Aiming for minimum disturbance; a safe, clean and tidy environment, just as we found it. Prices depend on the appliance and layout of the job undertaken but check our Deals page for a great deal on a combi to combi install with the appliances chosen. 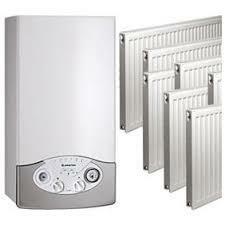 Combi boilers have been the main type of boiler people have been getting installed over the past couple of decades. This is mainly because they are so efficient and can save on your energy bills. Combi boilers are instantaneous, heating the water on demand when you need it. The other reason they are so popular is that everything is confined to one unit Which means no Tanks taking up space. Converting everything to mains pressure is an added bonus that comes along with installing these boilers. Providing you don't have too many hot water outlets (Reducing the flow rate) Then upgrading to a combi is definitely the way to go for you. However, if you are comfortable and just love your Conventional boiler with hot water storage then jump down and read system boilers. System boilers are boilers that work in conjunction with a hot water cylinder, There are two Kinds, one being a pressurized type with the pump internal and the other being gravity fed from a small header tank and the pump external. Good points of converting to a system boiler or keeping your original system but upgrading the boiler are that you will have storage on tap, if you have too many tap outlets. Also sometimes people just love to keep the cylinder cupboard as a drying compartment and keeping their towels warm. If you are unsure what to go for between the two then Don't hesitate to give us a call on 07539633018 or contact us through the contact page. We would be glad to help! If your house currently has no central heating then getting that installed is a must in this day and age! storage heaters/Electric heaters are so inefficient and costly that getting a full central heating system installed will work out much better in the long run for you. The simple fact that central heating gives off a much more enjoyable and quick responsive heat is also a good reason. If you currently have a central heating system but it is really old and aging with possible thin microbore pipes and just all around badly installed then upgrading and renewing the full heating system is maybe the best option for you. Brand new pipes and new clean radiators can finish a house of lovely if that's what you're aiming for. With years of installs under our belt, we can leave an outstanding job for you in a really quick time. Check our deal page for an amazing one of deal with a 5, 7 and 9 radiator install pack and working off an ERP A rated, efficient Baxi 630 boiler that comes with a 7-year manufacturer warranty and our own Guaranteed 10-year Prothermal Contracts installation warranty for a great piece of mind.